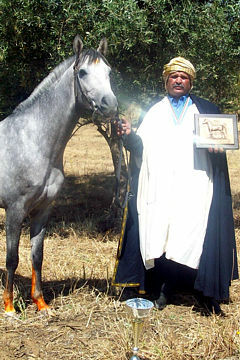 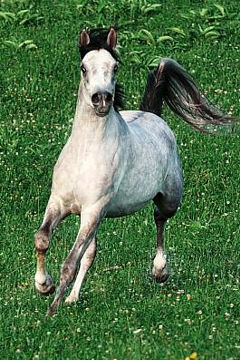 The Arab Horse Society is pleased to announce that their 2016 WAHO trophy winner is the mare Jammilah. 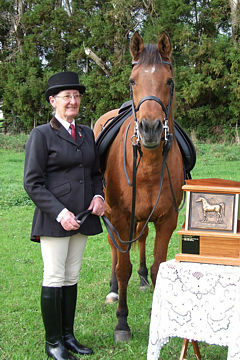 The WAHO Trophy will be presented in a public ceremony at the AHS National Championships Show at Malvern at the end of July. 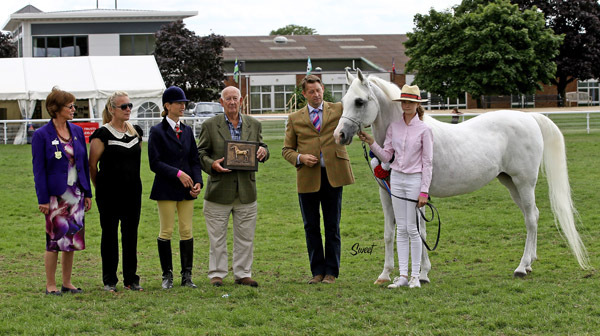 (left to right) AHS Council Chairman Mrs. Annette Dixon; Mrs. Rebecca McEvoy representing the breeder – her mother Mrs Wendy Carr; co-owner and rider Mrs. Joanne Woodward; WAHO Treasurer Mr. David Angold; Owner Mr. Darren Ash; Jamillah and Miss Millie Woodward Ash. 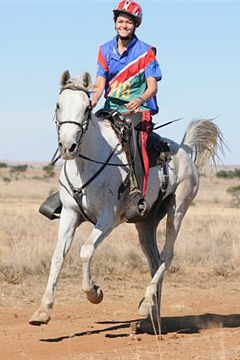 Jammilah has been awarded the Trophy in recognition of her outstanding show career which spans many years, both in hand and under saddle, as well as for the continued success of her first and second generation offspring. 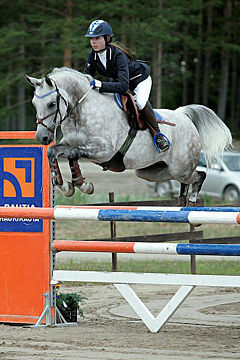 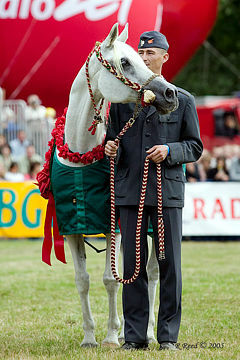 Her show career started as a yearling, when at her very first outing she was overall in-hand Champion. 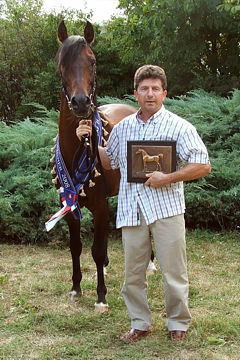 She was Reserve Best two-year old at the AHS National show from a combined year group entry of 70 fillies. 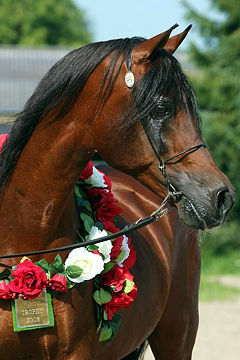 In 1996, she went one better, winning the Best three-year old from a combined year group entry of 72 fillies, and took the title of Reserve British National Junior Female Champion. 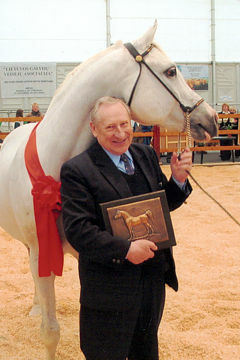 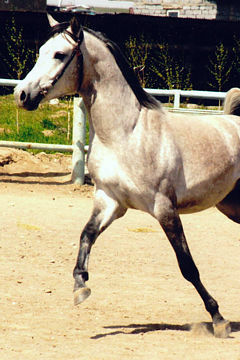 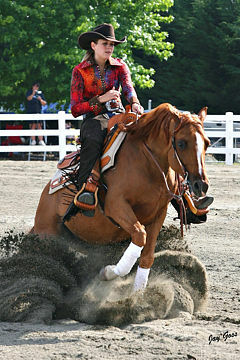 Brought out under saddle by Joanne Woodward, who was to partner Jammilah to her many successes, she won all four shows she entered in her first season as a novice. 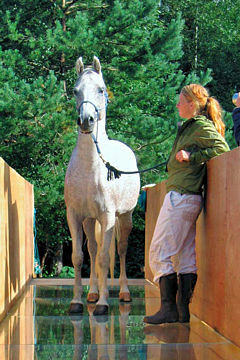 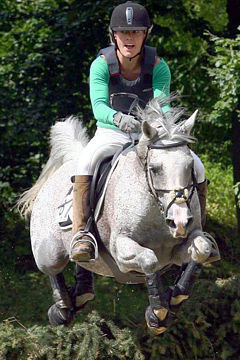 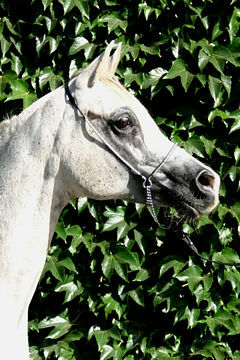 Returning to the showring in Open Ridden Classes in 2000, she took many Supreme Championships and the first of her British National Champion Ridden Mares titles. 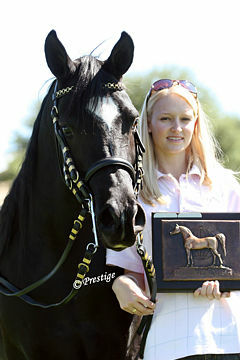 After another two incredibly successful seasons, Jammilah ended her ridden career in the best possible way by taking the second of her British National Champion Ridden Mare titles. 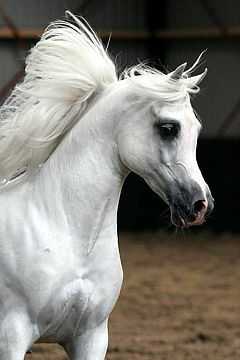 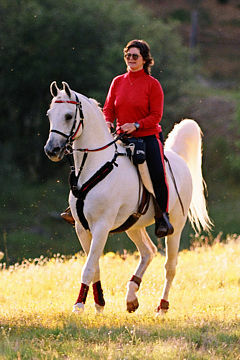 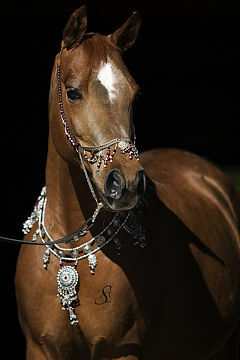 Her ridden career culminated in being crowned Champion Ridden Arabian at the Horse of the Year Show in 2003, an exceptional achievement as she was the only mare to have achieved the title since the classes started at Wembley Arena in 1998. 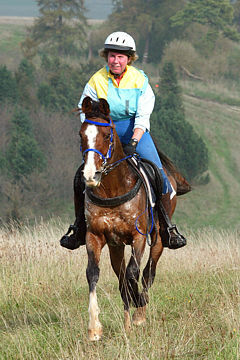 Once retired from showing, Jammilah started a new career as a broodmare. 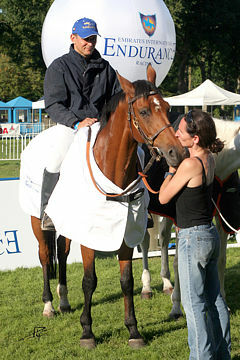 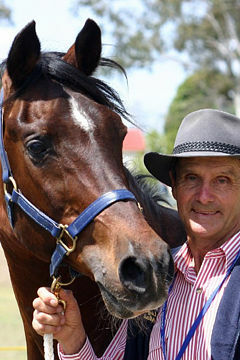 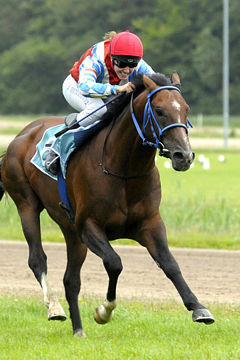 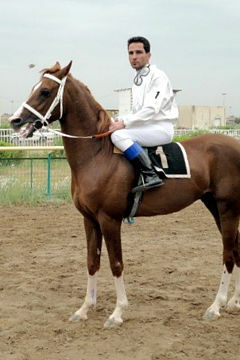 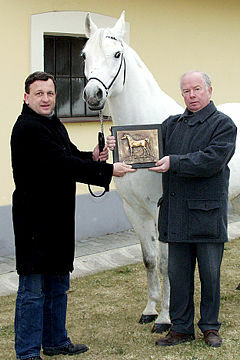 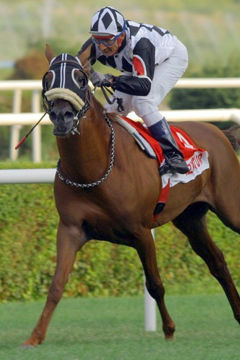 Her first daughter Jumainah by Aazari has achieved many wins both in hand and under saddle and also in dressage, and is now a broodmare herself. 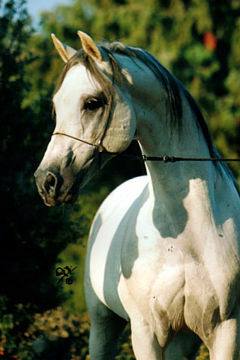 Her second daughter Jamissiah, by Narismma, has also had great success in the show ring and is now embarking on what promises to be a successful endurance career. 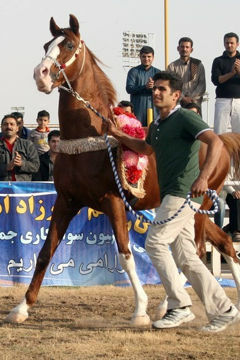 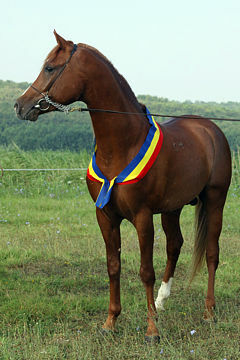 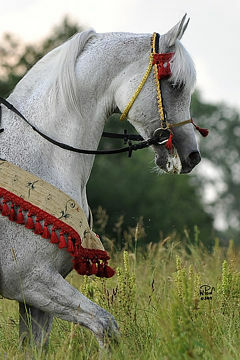 Jammilah is also now the grand-dam of Jumainah’s daughter Maya Joharra by Azteq, also proving to be very successful under saddle including being placed at The Horse of the Year show at only five years old.